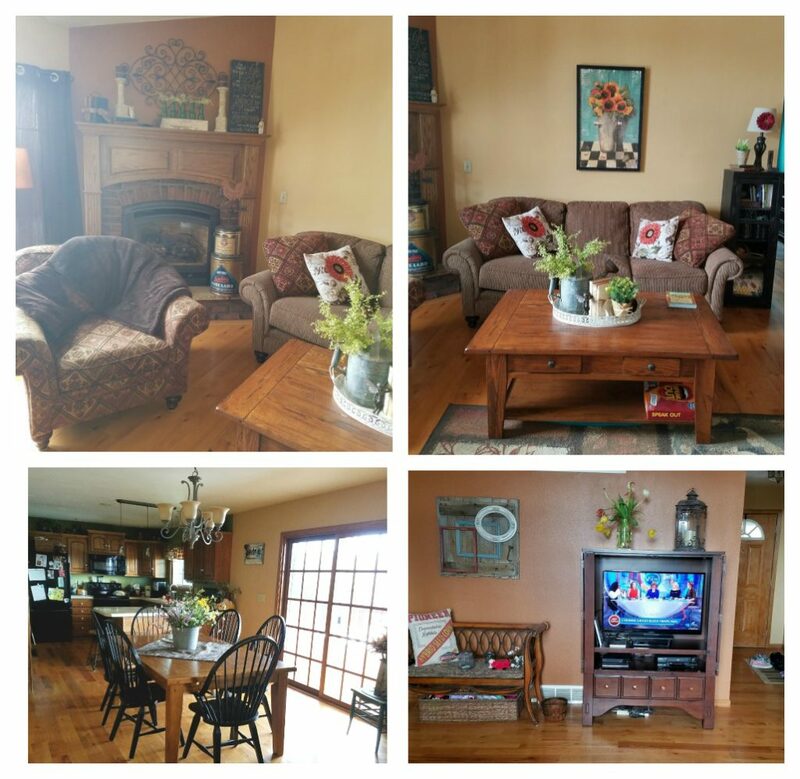 Michelle wants to brighten up this living room and give it more of a farmhouse feel. I think she’s actually closer to that look than she realizes. In my opinion, there are only a few things I’d personally change about this space and it’s all very budget friendly. Paint the Coffee Table: Instead of buying a new coffee table, I think Michelle could easy update this one she has with a fresh coat of paint. It would be such an easy fix. I’d suggest painting the whole thing a soft grey or white, or she could even stain the top of the table a dark color and only paint the lower half. I did a similar look on this dresser. Keep the Couch: I think the couch can totally work in this space. I’d only recommend getting a handful of new throw pillows to brighten it up a bit. 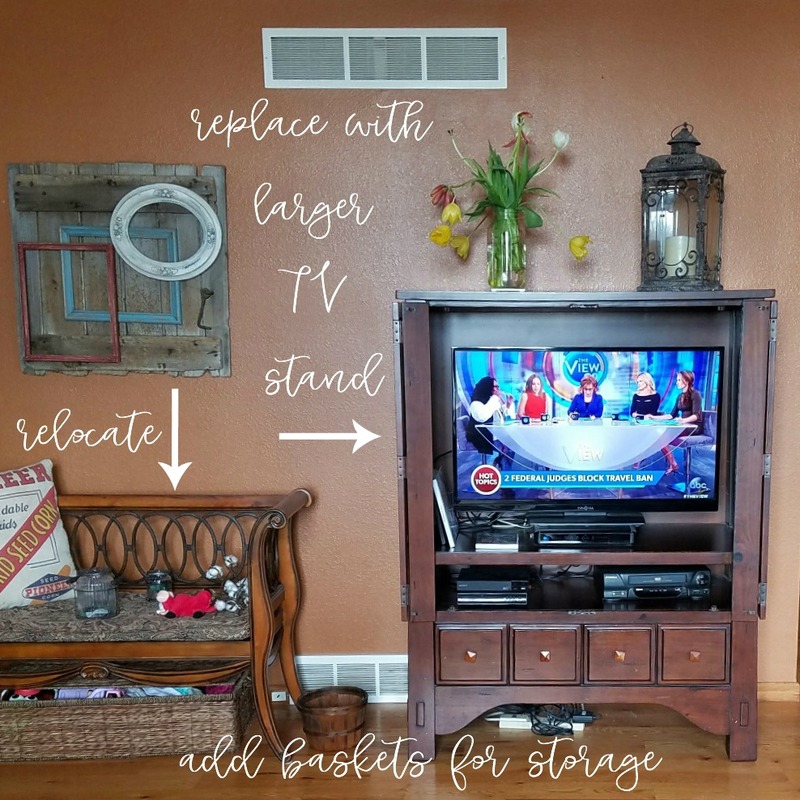 Paint Brick & Mantel: Updating the brick and wood mantel with fresh paint would be a quick and affordable solution to brighten up this corner. I think Michelle would be safe to paint it a soft white color, which would compliment the cream colored walls. This is a gorgeous fireplace and a big of updating would really make it pop. And painting brick is actually very simple, I have an easy peasy tutorial here. Add Shiplap in the Space Above Mantel: To really get that farmhouse look, I’d recommend adding shiplap in the space above the mantel. This will make the fireplace a focal point of the room and add character to the space. Very affordable and DIY friendly. I have a tutorial on installing shiplap here. And I also found this great tutorial for adding shiplap above a fireplace. If Michelle does decide to go this route, I’d recommend first painting over the brown paint with the cream color on the other walls. That way the dark brown doesn’t try to peek through the slats in the shiplap. New Curtains: You can barely see just a bit of Michelle’s curtains, which look to be a shade of dark purple. I’d suggest switching these out for drop cloth curtains, which are super affordable and perfect of the farmhouse look. See my post about drop cloth curtains here. I think Michell’s living room is really close to being what she wants. Just a few changes will make a huge difference. Using some of the existing furniture she already owns, like the couch and coffee table she can paint, will allow her to save money and leave room for a few new pieces like the accent chairs and rug. And that fireplace is just so full of potential, it could easily become the star of the room with some fresh paint and shiplap. Paint: I’d start off by painting this wall the same cream color that is in the living room. That will brighten this space up and pull it all together nicely. New TV Stand: The current TV console is too small for this wall. I’d simply replace it with a larger one that will take up a bit more of the wall space. I love this one, but here are a few other options that are would also look great. Relocate Bench: If possible, I’d consider relocating this bench. That will open up more space for the TV stand. Add Storage: I’d suggest adding a few storage baskets on either side of the TV stand for blankets, pillows, and other living room goodies. I love the idea of using this wall as the media center area. With some fresh paint and a new TV stand, this area will look completely refreshed. Now let’s move on to the final space: the dining room! Keep the Chairs: I absolutely love the chairs Michelle already has–great style and perfect for the table. 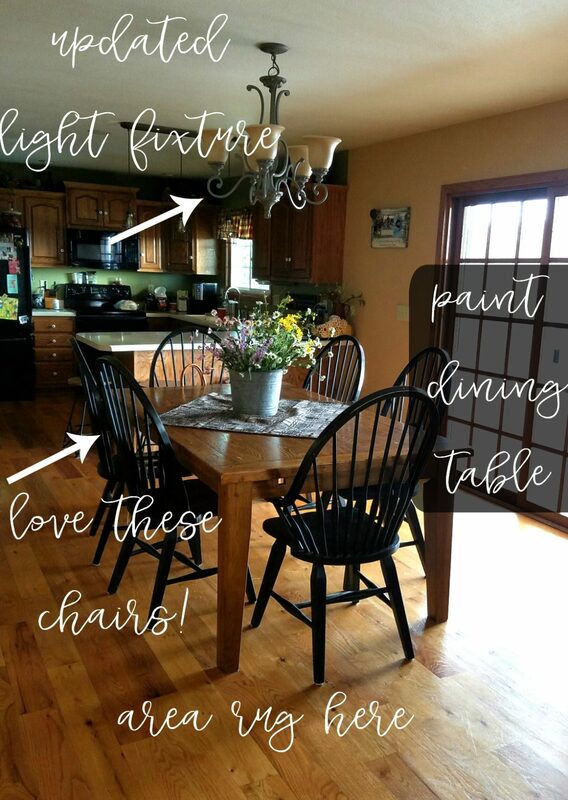 Paint the Table: If Michelle wants to save money in this space, I think she would do well to paint her dining table. I think a crisp white would look amazing with her black chairs, but she could also paint the top white and use a different shade for the lower half–such as a gray or a soft pastel color. I did a similar paint combination on the table in our breakfast nook and I love it. See that project here. Wow. That was a lot. Are you guys still here? Bueller….Bueller? I sure hope you’ve stuck around through all of that, I know this was a long one. 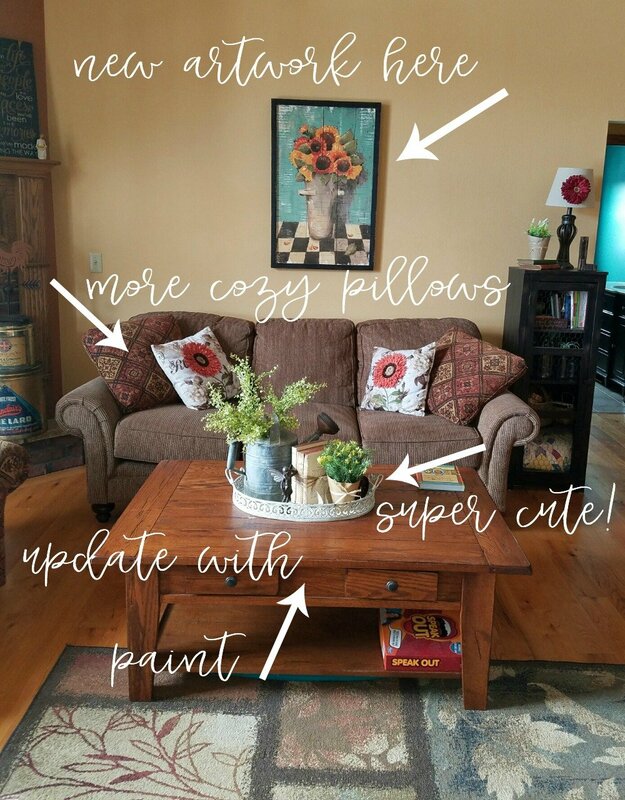 But I wanted to help Michelle bring a completely new feel to her living area and dining room with a full blown spring refresh! 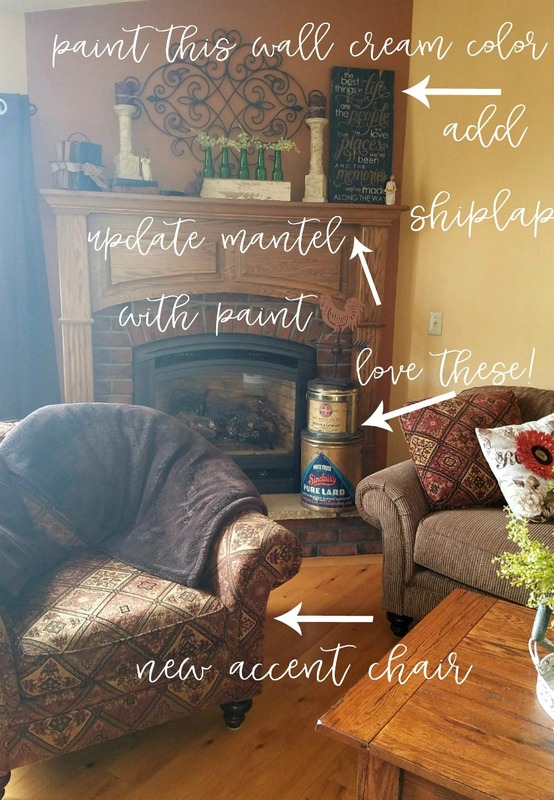 I’m so excited for her to make these changes, but I have to say–I’m the most excited about that fireplace. I think that little corner could look ammmmmazing with just a little bit of work. And really the same can be said for all of these areas–there is just so much potential. It will only take a few key changes, some fresh paint, and a little rearranging to make a big difference in her home. 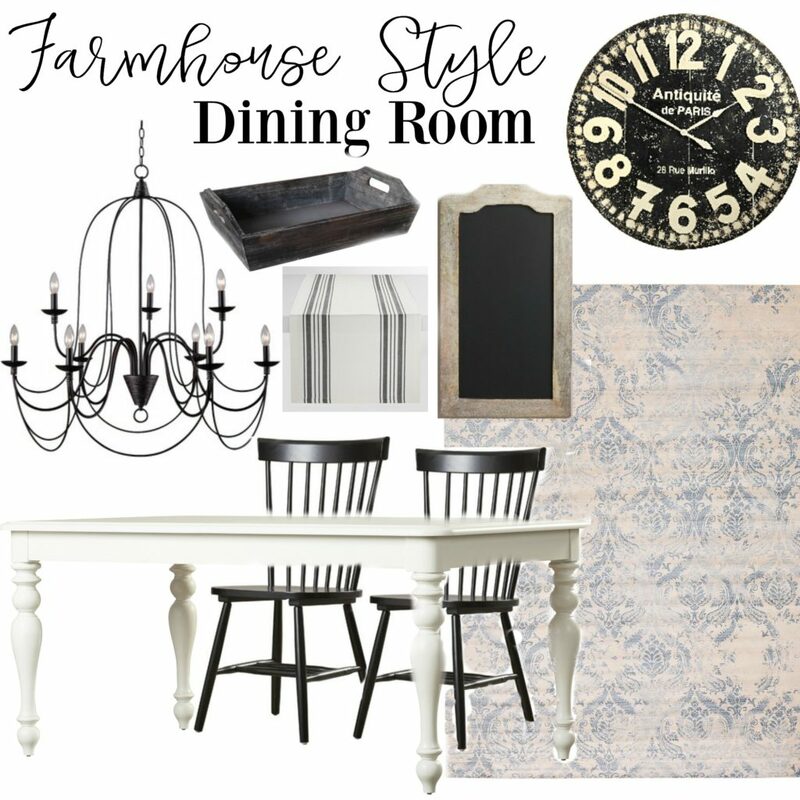 I put so much time and energy into these Farmhouse Rehab posts and I really hope you all get a few ideas out of it. Or maybe it sparks something that inspires you to mix things up in your own home. Either way, I’m so glad to have you stop by and see what I’m up to. I’d love to hear what you think and definitely let me know if you have any questions! Want to submit your space for Farmhouse Rehab? 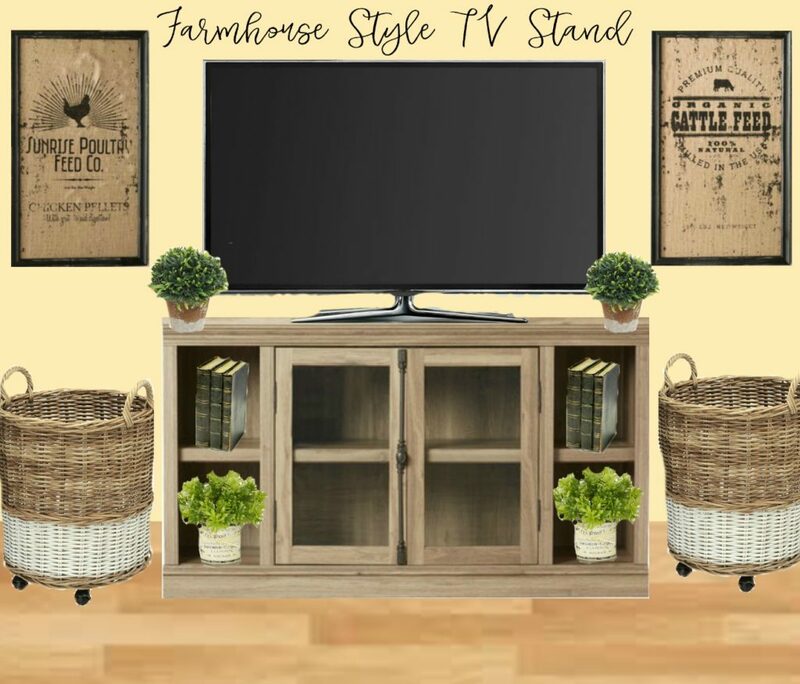 If you’d like to get my input on a room in your home, just send me an email at [email protected] with the subject line FARMHOUSE REHAB. Be sure to include a few good photos and let me know what you’d like help with! You’ll receive an email back if your space is chosen for the next feature! Now let me give you a quick disclaimer. I’m not a professional. I don’t have any fancy design degrees or certifications. As I always say, decorating your home is very personal and you should always do what feels right to YOU. These are just my opinions and suggestions! You really have put a lot of time and thought into this. I love how you put the design boards together to really get a good idea of how the finished room would look. These are all wonderful ideas and suggestions, Sarah! Thank you JoAnne, I really appreciate that! 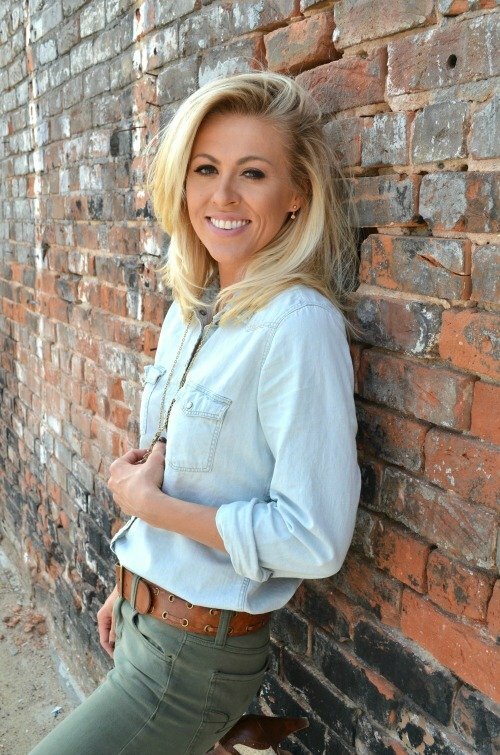 Love all your farmhouse updates Sarah! awesome, spot-on ideas!!! Great suggestions! You are always spot on, love seeing these make-over ideas for readers! That’s so kind of you to say Cristin, thank you!! Great job on updating these spaces! Hope Michelle is able to incorporate many of your ideas. There are so many affordable stores now like Home Goods, Michaels and Target that are fun to shop for that great deal. Enjoyed your post! Thx for sharing!! Thanks Michelle. And you’re right, there are so many affordable options out there now. You know I am obsessed with Michaels! I also wanted to add that while I know you focused on her dining room, and while she has her paint brush wet, she could paint the same soft white color under her cabinets for a very fast and easy room brightener in her kitchen to go with the dining table. Just sayin’!! Oh definitely, she could totally change the look of her kitchen with a bit of paint! Marilyn, you are way too good to me! Thank you so much, I can’t tell you how much I appreciate that. And you! Terrific job Sarah! I love to see before and after ideas…what a tremendous help you are and you definitely have an eye for design! Thanks Jana, you are so sweet! Awesome ideas, I love the design boards. I would love to see the changes she makes to her rooms. I hope we can see some after photos too! This is such a great post! I love the baskets on coasters! Great ideas! This series is really helpful! Thanks for all the time you put into this! Thank you Jessica, I’m so glad you like the series! Oh yay, so glad it inspired you Suzi!! I agree Helen, so much potential in that kitchen!! haha I would love to Nancy! WOW! Excellent post. All your ideas are fabulous. I would love to fly you to my house to do some updates. I really hope we get to see some after photos. What a difference there would be. I would love that Pamela! Haha! And yes, I hope we can see some after photos too. This reader has to be so blessed by your help! I just love everything you suggested to her! This advice from a “professional” designer would cost her a pretty penny and couldn’t be any better than what you have done for her! Love this post!!!! You are so talented! So many great ideas! Thank you for taking the time to share with all of us – it’s such a huge help!!! Can’t wait to see tomorrow’s post!!! You are too kind Tracey. Thanks so much for the sweet words and encouragement! Sarah, You may say that you’re not a professional decorator, but you are pretty darn close!! Great, very doable ideas! You are awesome!! P.S. Love the Bueller reference, lol! haha thanks Heather! Gotta love a good Bueller reference! LOVED reading this, Sarah. Great job and very inspiring! One of your best blogs, love it! 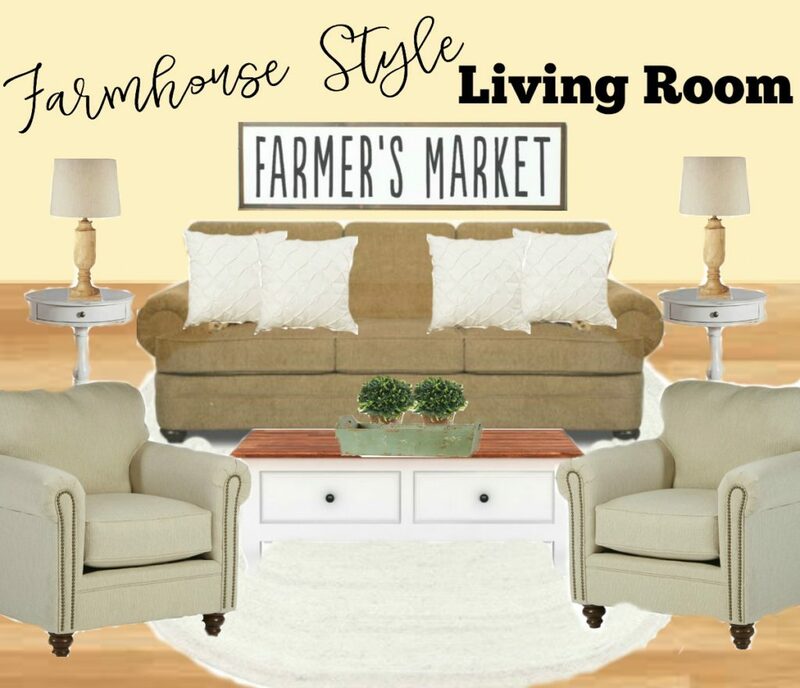 Great ideas that I’m sure everyone reading this could tweak and incorporate into their own spaces if they are after that fresh farmhouse look. Great work! Wow, thanks Ronnie–I really appreciate that!! Sarah, I love your posts and these are my favorite!!! Keep inspiring others!!! Aren’t they fun?! I love Farmhouse Rehab too, it’s so nice to mix it up. You are amazing! Love your suggestions for her. She is sure lucky, and so are the rest of the readers who read your post. You are way too kind, thank you Mary! I am always in love with all your ideas! Your designs awesome! I love these posts, they are so helpful. Thank you for your time in putting it together. I’ll have to submit my farmhouse rehab request too! Thank you for doing this service. Yes, please do that Heather. I’d love to see it! What a cute house with so much potential. Great ideas Sarah. There are some ideas on Pinterest about re-doing chandeliers to make them look vintage and adding Edison lights. I have done a few of those and they turned out really nice and saved me money. Really enjoying this farmhouse rehab series. I love your ideas. I like how you gave the final look pulled together! Really enjoyed this post, Sarah. Your thoughts to lighten and update the spaces were affordable and practical. Looks like painting the kitchen cabinets could be next! Your “client” had “good bones” to work with and already had a collection of nice accessories. Other ideas to keep costs down: Buy a dresser on Craigslist or at a thrift shop and paint it for the TV stand; Paint the dining room chandelier distressed white and replace globes with seeded glass or even wire bedsprings; Slipcover the chair in the living room with drop cloth or neutral fabric. Loved the bench next to the TV cabinet. Would love to see that in an entry or at the end of a bed. Thank you Ann, I’m so glad you enjoyed it and found my tips helpful! LOVE the dining room idea board! I’m at a similar place in my home — replacing all my mix matched furniture with cohesive pieces. Can’t wait to see the final product! Thanks so much Emily, I’m glad you like it. Good luck redoing things in your own home! All of your tips are amazing here! She’s got great bones to the space and some paint will really go a long way to brighten the space up! LOVE this series that you do, I think it may be my favorite posts on your blog. Wow thanks Chelsea, I really appreciate that! I love doing these Farmhouse Rehab posts too.